Theater of War | Theater | Style Weekly - Richmond, VA local news, arts, and events. For three decades, guys and dolls have left the stage and hit the gridiron. All Richmond actors already lead dual lives — and for some, even that&apos;s not enough. By day, many of them have secret identities: normal jobs at normal places such as Capital One or the Library of Virginia. On nights and weekends they become thespian gods and goddesses to delight audiences on Richmond stages. But many of these greasepaint superheroes also have other secret identities — as football players. The Byrd Park Football League — or BPFL as it is lovingly called — has had regular games for nearly 30 years, is almost entirely made up of Richmond theater folk. “Almost every local actor has played with us,” says actor Ford Flannagan, a league founding member who starred in Theatre IV&apos;s “Peter Pan” last season. Every area theater, he says, has been represented on this field at one time or another. 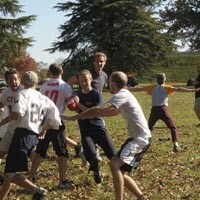 But anyone can play in the ongoing two-hand-touch football games on a field at French and Blanton streets, near Byrd Park. True to the “anyone can play” edict, the BPFL graciously included this writer in an early season game. It was a morning of sports meets theater. In the huddle, quarterback and actor Mark Persinger (who played Big Jule in Barksdale&apos;s “Guys and Dolls”) laid out a strategy he termed “choreography.” The play put Ronnie Brown (who is currently touring with Theatre IV&apos;s “The True Story of Pocahontas”) a foot from the goal line, where he launched into a victory dance before he was “tackled” by actor Eddie Tavares, seen in last season&apos;s “Peter Pan.” “Remind me which theater is playing ‘Showboat’ this season?” Persinger quipped.